Captured by the Holy Cross Knights, Guts is in stocks and imprisoned as night descends. The demons and evil spirits his brand attracts will be here soon and being surrounded by a company of knights won’t be much protection. He needs to escape. Farness, the female commander of the knights, is shocked by the events of yesterday. She’s caught a glimpse of something she’s never encountered in Guts, and it’s only going to get worse. Night is falling and she’s about to learn first hand why Guts has so many weapons. Why he’s left a path of carnage in his wake. Guts might be a human monster, but he’s the only one capable of fighting the inhuman denizens about to fall upon the camp. BERSERK 17 transitions us into the second half of this story. The first was all about how Guts became the Black Swordsman, now we’re moving past that. He’s had his two years of fruitless revenge on Griffith and things are changing. Something is building in the world. An evil is growing. What started on the eclipse is not over. That was just the beginning for whatever plan the Godhand have for their newest member. As the world falls apart, a “savior” is needed. Miura does a great job with this transition, showing us more of the world through the introduction of Farness and by jumping back to the characters we’ve met in early parts of the story at Windham. Momentous things are building, and Guts will have to face his decisions. That moment when Guts realizes what he’s doing is the pivotal moment for his character. The last two years of rage have only transformed him into something like Griffith. Is that what he wants? It’s time for Guts to decide to keep being a coward, or to be a hero for the last person left he cares for. 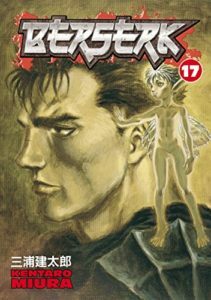 BERSERK continues to be a great read! Powerful, full of deep and complex characters, with themes that make you reflect! You can buy BERSERK Vol 17 from Amazon.